Hi Pamela: I do wish the USA had more manners, it seems the younger people are getting worse as far as morals and manners. Does it work in real life...I have heard the Japanese people are very polite. 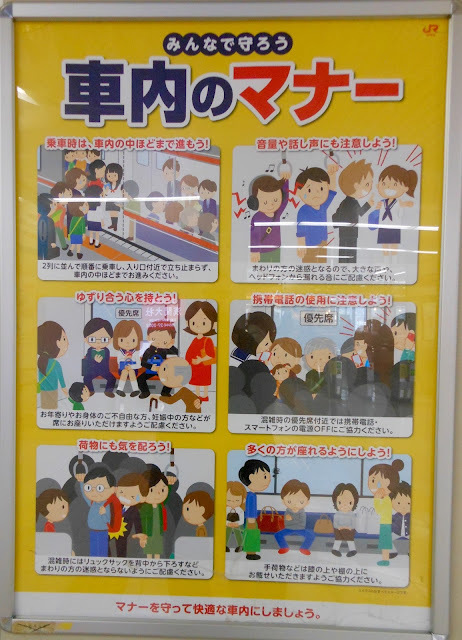 In Tokyo you often see posters with another bad manner the train company want you to refrain from - applying make up in the train. Those posters don't work, though, as I often see girls curling their eyelashes or brushing on blusher. I think the parents of the Millennium Generation forgot to teach their kids good manners. I rarely see them hold the door for the person behind them. We are often "blessed" with hearing cell phone conversations when you wish you couldn't. Screaming kids are left to screech in the stores and restaurants. You hardly ever see a kid give up his seat to an elderly person or pregnant woman. The sad thing is that all you can do is watch it go by. Don’t get me started!!!! People don’t let passengers off first .... children don’t stand up for older people ..... and then there are those that wait till the train stops to even leave their seats ..... ooops no I’d better stop there! But then my husband was walking home with heavy shopping recently and (on two different days), as he put the bags down to rest his arms, he was asked by a young person if he would like help carrying his bags. He said it was nice of them to offer, but not necessary! Hubby is very active and was quite surprised by the offers! What a cute sign! And it does what it is meant to do - even without understanding the words, you understand what it says.